The rice plant (Oryza sativa species) was domesticated in Asia some 8,000 to 10,000 years ago. At the beginning of the 21st century, it is still the leading cereal in human food systems and the main source of energy and significant share of proteins consumed by almost three billion people. In some Asian developing countries, the annual consumption per capita can reach 200kg of white rice, but it falls to approximately 50kg of high quality grains in rich, industrialised countries like Japan. The annual global production of rice amounts to over 600 million tonnes of paddy rice (the whole grain before milling), 90% of which is located in Asia where the largest producing countries are China, India, Indonesia, Bangladesh, Vietnam and Thailand. The crucial production of the “grain of life” depends on a myriad of very small family holdings often managing less than one hectare of paddy fields per household, for example in China, compared to four hectares in Thailand where the availability of farmland is far superior. 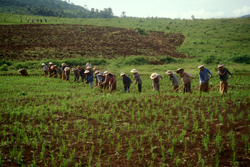 Rice lands occupy some 150 million hectares worldwide, i.e. 15% of the global farm area and almost a quarter of the world's cereal crop lands. More than 200 million rice farmers are involved in this production, with a growing number of part-time farmers combining this activity with other economic ones, like in Japan in the past. This industry is therefore the most important human activity on earth. A large proportion of the production is self-consumed at the farming household level and the surplus ends up on the local and domestic markets. Only 6 to 7% of the rice harvest is exchanged between countries on the world market, with Thailand, Vietnam, the United States, India and Pakistan as leading exporters. Industrial countries import several million tonnes of high commercial value aromatic (Basmati or Thai) rice, but far greater volumes of lower quality rice are exported to tropical developing countries, particularly in Sub-Saharan Africa and the Middle East. Rice-growing is very deeply rooted in Asian cultures and identities thus contributing to bringing Asian people together (the ASEAN [Association of South East Asian Nations] symbol is a bundle of rice panicles). Although lasting decades, small-scale rice farming is often unprofitable - a most remarkable fact in this part of the world, accustomed to double-digit economic growth during the last decades. The emperor of Japan is a sacred rice grower, while the royal ploughing ceremony continues to mark the start of the wet season rice-growing cycle across Thailand in early May. As S. Rushdie wrote: “Even where paddy fields are under concrete blocks today, rice has left its mark on us”. This essential cereal crop can be produced in extremely different ecological conditions, from the large and flat coastal plains to mountainous terraces, reaching up to 2,700m in the Himalayas, and from the Equator to 53 degrees north latitude in the Chinese province of Heilongjiang. In the irrigated rice ecosystem, double or triple cropping in the same field every year is possible thanks to controlling surface water, which is the best herbicide. With more than a half of the total rice-growing areas and three quarters of global production, these large “rice bowls” feed densely-populated (more than ten inhabitants per hectare of rice land is common) deltas and alluvial plains, dominating in the far East where China feeds a fifth of the world population on only 9% of arable lands. While average paddy yields attain 5 to 6 tonnes per hectare and crop cycle in the wet season, they can reach up to ten or even twelve tonnes per hectare in the sunny dry seasons, especially in Chinese rice fields planted in early-maturing super hybrids producing more than 100kg of paddy per hectare and per day in a crop cycle! In tropical Asia, the green revolution in rice (1965-1990) had a tremendous impact on this irrigated ecosystem through the combination of technological innovations (particularly the adoption of semi-dwarf varieties responding to nitrogen fertilizers and with high potential yields) and supportive policies (irrigation and drainage infrastructures, price and market policies, agricultural research and extension services). 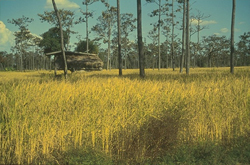 The physical productivity of the land thus tripled during this period; most of the key cultivation practices were mechanised - with the ubiquitous multi-purpose hand-tractor playing a major role - but farm employment increased, while the fall in the real price of rice acted as an important engine fuelling the economic take-off in many countries. This, however, led to environmental degradation such as lower water quality, pesticide residues, a decrease in fresh water fisheries in rice areas, which needs to be corrected by designing and adopting new cropping systems. 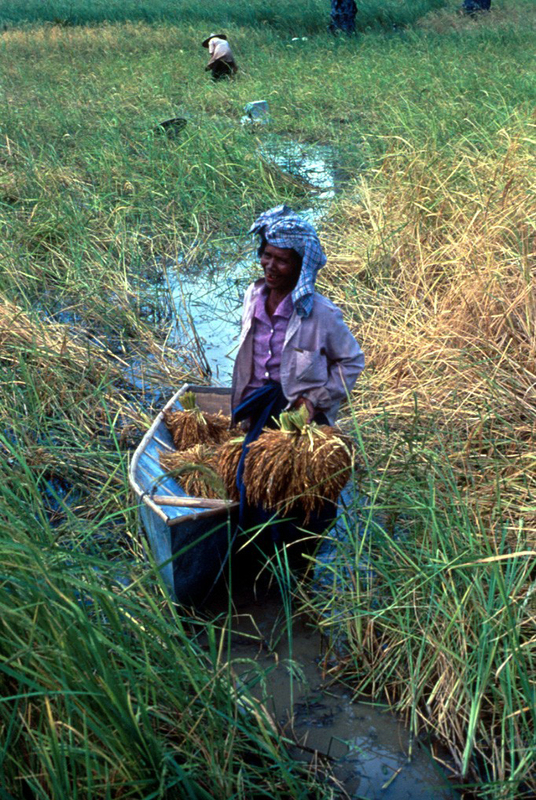 They still need to be very productive but far less dependent on external inputs by relying more on useful ecological regulations available in rice lands. The challenge is impressive as these irrigated rice bowls will need to feed an increasing number of consumers with less land (due to urbanisation, soil salinity and crop diversification), less labour (as the industry and services sectors absorb a growing share of the labour force), less chemical inputs (due to the cost of mineral fertilisers and the need to stop the overconsumption of pesticides) and less agricultural water (because of increased competition with other users of this key but increasingly scarce resource). Using up to five cubic metres of water to produce one kilogram of paddy rice, while releasing two thirds of the nitrogen applied to the crop in the environment, will simply not be possible anymore in most Asian rice-growing regions. 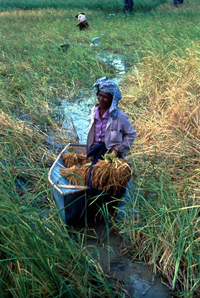 The production of rainfed lowland rice accounts for a quarter of the total rice-growing areas. The fields are bounded but flooding depends on rainfall in the absence of irrigation infrastructures, and most of the time the submersion control is not satisfactory. The risks of drought early in the crop cycle or during flowering, and floods during the peak of the monsoon, are common and sometimes both occur in the same season. With only one crop cycle per year, this system is still widespread in South and Southeast Asia. 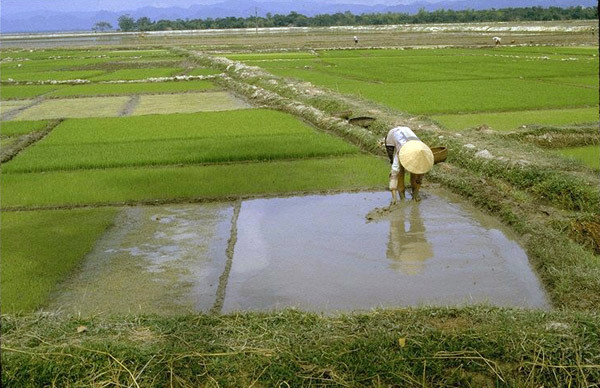 It was bypassed by the green revolution in rice because the lack of control over the surface water level prohibited the adoption of semi-dwarf cultivars, resulting in major inter-regional inequalities. Tall traditional cultivars are still very common, yielding usually 2 to 3 tonnes of paddy per hectare. Deep water rice is a more marginal and shrinking ecosystem, encompassing low-lying coastal and mangrove areas, including the production of floating rice (with stem-lengths reaching more than 5 metres in some cases). Soil productivity tends to be low (yields of 1 to1.5 t/ha are common) and very often these rice lands are converted to aquaculture (fish, shrimp, crab, etc.). Upland rice production is another marginal ecosystem where rice is grown in non-flooded and non-bounded fields in sloping highlands and by relying on slash and burn techniques. 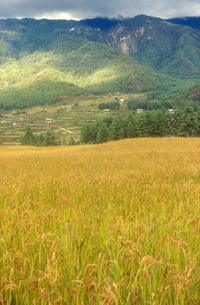 The gradual integration of these remote areas into the market economy, combined with the increasing forest conservation pressure, leads to the frequent conversion of upland rice production into a diverse range of commercial crops (maize, fruit and vegetables, rubber, etc.). Rice was already cultivated during the upper Neolithic period in the middle of the Yangtse valley (where a 7,000-year-old irrigation and drainage system was uncovered at Chengtoushan) as well as in the upper valley of the Huai river in Southern China, then later in Uttar Pradesh, Northeast India. In those days, other staple crops were possibly barley, millet, buckwheat or tubers. Rice breeders admit that Oryza sativa was independently domesticated in China and India, from annual forms of the O. rufipogon wild species, giving rise to the two main groups of indicas and japonicas. The two groups are distinguished by their respective geographic origins, morphological and agronomic characteristics, as well as biochemical and molecular markers, and these differences make their recombination difficult (for more details about the complex structure of the Oryza sativa species, see B. Courtois, 2007. A brief history of rice and its genetic improvement. Cirad, France. 13p. Available as an open archive). Recent research results have shown that indicas and japonicas genomes could have evolved differently well before domestication, at least 200,000 years ago and probably 2 or 3 million years before, possibly in relation to the erection of the Himalayan barrier. Indicas are widely cultivated in irrigated and rainfed lowland rice areas of tropical Asia, while japonicas are mostly found in irrigated temperate, high-elevation and upland rice areas. 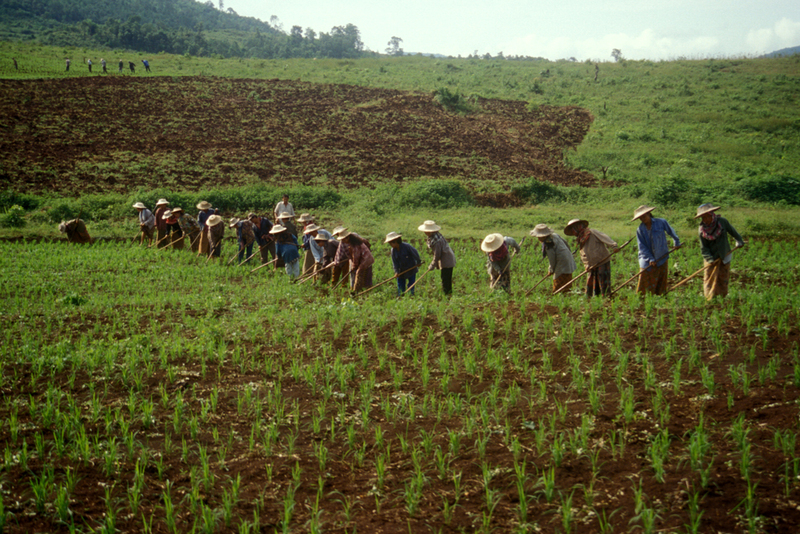 In China, rice production in bottoms of valleys and deltas with soil puddling and transplanting could have been in use before the production of upland rice, while the contrary could be said in the case of Southeast Asia. But beyond this simplistic bipolarity between the two groups, the current genetic diversity of rice is amazing and is the result of crosses between species or internal to O. sativa by natural or man-made selection (particularly on-station breeding which has been going on for more than a century in China, Japan and India). One estimates that some 150,000 rice varieties are currently known and the gene bank of the International Rice Research Institute (IRRI) at Los Baños, Southern Luzon, Philippines keeps 107,000 different types, including 5,000 wild ones in its quake-proof facilities. Thanks to its relatively small genome, of which the complete sequence was published in 2005, rice was selected as a major model in crop genetics at the international level. From this extensive reservoir of natural diversity, new varietal selection techniques relying on molecular biology are currently used to build rice cultivars that are more resistant to water deficit, deep submersion, or salinity in particular. 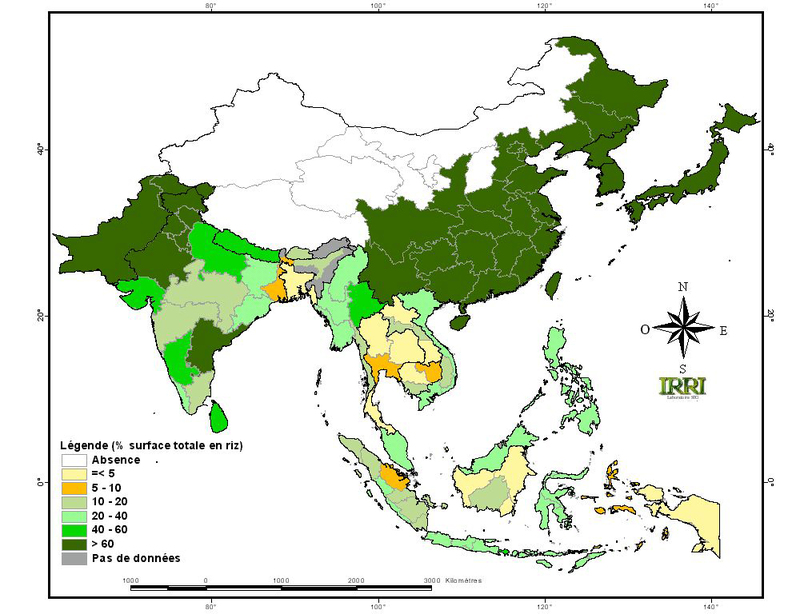 The selection and dissemination of such varieties in the rainfed lowland ecosystem where major zones of poverty remain especially in South Asia could contribute significantly to the objective of increasing rice production by 40% by 2030. This is needed to win the race launched half a century ago between production and demographic growth, and to be able to satisfy the needs of 4 billion consumers at the current level, which is unsatisfactory in many developing regions. The political stability of states will depend on the result of this challenge because, according to Deng Xiaoping: “without enough grains, it is chaos”. Beyond the volume of rice production, its yearly stability must be guaranteed. More attention should be paid to strengthening the capacities of rice systems to buffer climatic strain (drought, flash floods, etc.) or economic crises, causing the price of rice to triple over the course of a few months in 2008. To achieve this, the deep anchoring of rice systems in Asian societies, and the fact that they are still dominated by flexible, adaptive and innovative small-scale family holdings are two strong comparative advantages. Environments & Societies Department, Cirad, Montpellier, France. published in 2004 by Editions Belin, Paris.